My husband LOVES milk and he especially enjoys chocolate milk. 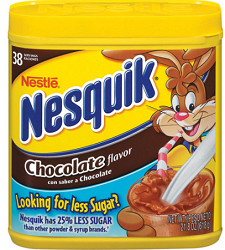 Nesquik is very yummy and right now, you can get a FREE Nesquik Chocolate Beverage Sample Pack by clicking here. Sample pack includes five (5) NESTLÉ® NESQUIK® stick packs and a coupon to save $1.50 on your next purchase of any size, any flavor of NESTLÉ® NESQUIK® powder. Offer good in the US only. Offer valid only while supplies last. Limit one (1) sample pack per household or address.